Original Samsung 16GB MicroSDHC Memory Card - Class 6 Fast Speed - Water Proof. Brand new Sealed, Official UK Stock, Fast Delivery M-F. 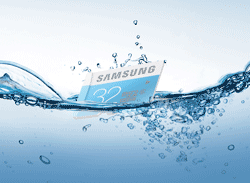 The Samsung Standard MicroSDHC Memory Card can survive up to 24 hours in sea water. 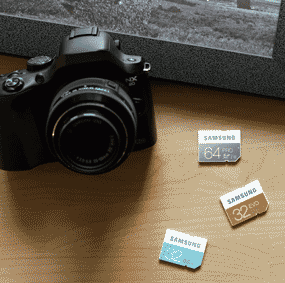 The Samsung Standard MicroSDHC Memory Card endures operating temperatures from -25 ºC ~~ 85 ºC. Resists more than 10,000 gauss, which is up to 13 times the magnetic force of standard home theater speakers. Don't worry about taking your Samsung Standard MicroSDHC Memory Card through airport X-ray machines, as it protects data from damage. Samsung's flash memory design helps make your choice easy. Samsung has redesigned the look with bright, colour-coded hues, representing the performance levels and features of each memory card. Each memory card is distinguished by a different colour according to its specific characteristics -- emerald blue for the Standard line, romantic orange for the EVO line or professional silver for the PRO line. Transfer up to 180 photos per minute. With a transfer speed of up to 24 MB per second, you can spend less time transferring memories and more time making them. Save up to 18,630 photos, 550 minutes of video and 7,490 songs. Download more media files and apps to your smartphone or tablet, and always know you've got plenty of space. Number one in memory since 1993, Samsung has a solid reputation for manufacturing high-performance, top-quality, premium-designed products. That's why Samsung memory cards are the trustworthy choice for recording, transferring and protecting your precious images to recall time and again. Samsung uses fine-quality NAND flash memory chips, fabricated from its own lines to ensure high quality.